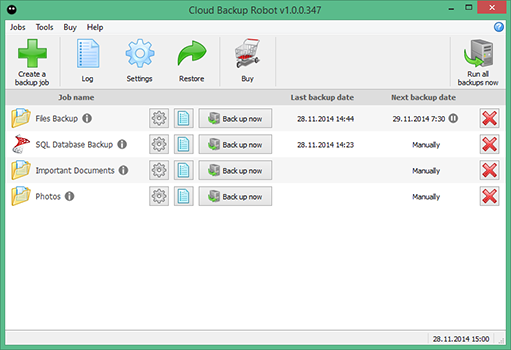 Cloud Backup Robot is free backup software for Windows. Make backups of of files, folders and SQL Server databases. The program zips and sends your backups to a local/networked folder, FTP or the Cloud (Dropbox, Box, Google Drive, OneDrive and Amazon S3). You will not have to spend tons of time trying to find your way around a complex menu. We simplified the backup software as much as possible. The setting is broken into several quick and easy steps. The program supports a number of popular cloud storage services, including Dropbox, Box, Google Drive, OneDrive and Amazon S3. Backup copies can be also saved to an FTP server, a network folder or a local folder on your computer. The program will create backup copies of any files and folders of your choice. File filters are also supported to make backups of files of the necessary formats only or for excluding unnecessary files. Cloud Backup Robot quickly and efficiently creates backups of your MS SQL databases. The backup process does not interrupt the work of your SQL Server services. The program can create database backups both from your computer and computers in a LAN, or on the Internet. Azure SQL Database backups are also supported. You can configure the program so that obsolete backup copies are automatically deleted without taking up hard drive or cloud storage space. For instance, you can keep 5 most recent backup copies, or keep backup copies made in the last 90 days. For space-saving purposes, the program will archive your backup files to a ZIP archive. The scheduler lets you create backups automatically in certain periods of time. A free backup restoration software is supplied with Cloud Backup Robot. We live in a digital world where information is king. Since the information you own is valuable, it is very important to back up your data regularly. So why would you want to back up your computer? These are the three most common ways you will lose your data and the main reasons why you need to back up your PC. Viruses are destructive programs that harm your computer. When a virus infects your computer and you have not backed up your data, there is a high likelihood that you will lose your data. So backing up your computer is very important, if for nothing else than peace of mind. If you love your photos, music, data and projects, backing up can prevent a tragedy. The main reason people don’t back up their data is the assumption that their computer will never crash. You don’t expect your computer will be the one to crash, right? “I mean, all I do is write letters or surf the Internet. The computer can’t crash just from doing that.” If that’s your mindset, you are a prime candidate for learning how to back up your data. You are using hardware that can fail, so backing up your computer will help you protect you from these events. In some cases, criminals can steal your computer or break your password. If you do not want to lose important files, back them up in advance and encrypt the backup archives. How should you back up your computer? Backing up your computer isn’t a hard or scary process; you can use PC backup software to do this. Just download and install backup software Cloud Backup Robot. The program will help you configure automatic backups according to your needs, including how often you want to back up. The answer depends on how crucial your data is. Everyone should back up computer files at least once a week, but if you are running a business, you should consider backing up your computer files every day. Doing this you will ensure that your files are always up to date, and if a crash or a theft does happen, you won’t lose important data. Once you have backed up your data, make sure you keep those backups in a safe place. Remember, once you have a backup, anyone can grab that USB flash drive or DVD disk. We recommend using a reliable online backup service. Dropbox, Box, OneDrive, Google Drive, or Amazon S3 are ideal for this purpose. So just know this: backup, backup often, and keep your backups in a safe place. Backup before downloading new programs or other Internet tasks that expose your computer to viruses and malware.